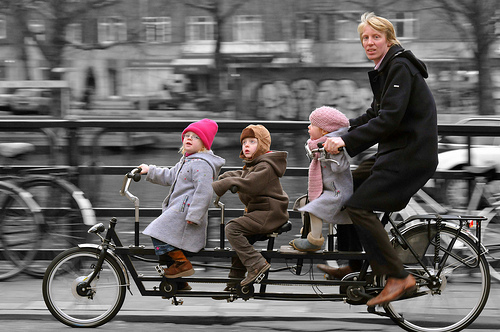 An Amsterdam family takes the cargo bicycle instead of the minivan. Photo by Marc van Woudenberg. This week, from May 16-20, representatives from NGOs, the government, private sector business and industry analysis firms will convene in Copenhagen, Denmark to share various opportunities for advancing the shift of goods and services transportation to non-motorized modes in European cities. The upcoming meeting will determine the routes that the CYCLE Logistics project will take in forwarding its ultimate 2014 goal of saving 1,300 tons (465,000 gallons) of fuel, putting 2,000 more cargo cycles into use in European Union (EU) cities, and shift 10,000 trips to intermodal transport chains (bicycles and tricycles used with other modes of transportation). The reasons this array of actors is pursuing CYCLE Logistics under the European Cycling Federation (ECF) are fourfold. First, the use of cargo cycling creates a marketable modern, green image of businesses for customers. Second, using cargo cycles to deliver goods without delay, particularly with adequate cycle infrastructure and traffic in motorized vehicle lanes, reduces logistical cost. Third, a cargo tricycle stand can reach locations shops cannot, for low-cost advertising and vending. Fourth, the use of cargo cycles in place of motorized transportation does not contribute to the environmental problems of air quality degradation and carbon emissions. The CYCLE Logistics project aims to increase the concentration of non-motorized service-oriented cargo cycling in the densest of European cities, as well as to spread this type of cargo transportation to smaller European towns. The project is a new EU-funded initiative working to reduce urban transportation energy use by shifting the transportation of goods and services from motorized vehicles to human-powered bicycles and tricycles. Businesses and organizations in the largest European city centers have initiated the shift away from motorization in order to decrease inefficiency caused by motorized transport, such as traffic delays, and therefore reduce costs. This shift corresponds with street calming measures and lower modal shares, which refers to the percentage of all trips made in a given area, in this case, EU cities, that use a given mode of transportation, in this case, motorized vehicles. 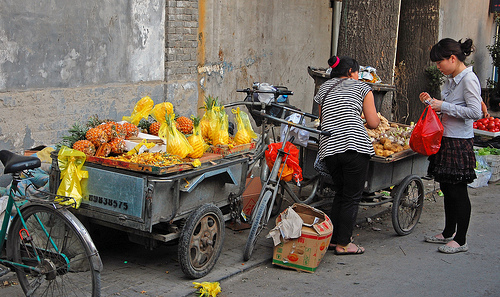 A vendor in China sells produce from tricycles. Photo by Tim Quijano. The project strives to promote behavioral change—pushing Europeans to transport goods and services with cargo cycles—among all individuals, organizations, businesses and levels of government. More specifically, individuals are encouraged to choose businesses that utilize cargo cycle delivery and use cargo cycles to transport their own goods and loved ones. Businesses are encouraged to offer more goods and services by cargo cycle, for instance, using cycles for take-out food and package delivery, or as cargo cycle snack vendors. The project also urges businesses offering services in the specialized trades, including workers like housing maintenance repairman and plumbers—to transport themselves and their tools on cargo cycles. Government agencies are encouraged to substitute motorized vehicles with cargo cycles. Currently, several EU municipalities use cargo cycles for various public tasks: delivering mail, carrying out geological land surveys, handling outpatient hospital services and collecting garbage. China presents an interesting case study of cargo cycle use. The population density of Chinese cities has resulted in hundreds of millions of bicycles and tricycles being employed for daily transportation, many of which are utilized in the cargo fashions that the CYCLE Logistics project desires to produce. Could the Chinese bicycle transportation system be a model for the project? A man in Beijing taking garbage to a collection center. Photo by Yang Liping. Though the bicycle’s status and modal share has fallen dramatically over the past couple of decades in China, the bicycle is still pervasive in Chinese society. The bicycle modal share across China is about one-fifth of all trips. Because of the country’s relatively low level of development, some may not see goods and services being delivered by bicycle in China as particularly surprising. In Beijing, for example, a garbage truck roaming through the city while residents come out to dump their garbage, as witnessed by a BBC reporter in Taiwan, is commonplace in China. More pleasant than the garbage truck, however, and also very common, is the garbage or recycling man cycling down the street, singing to let the residents know that he is coming to receive items. Snack vendors lay out their stove and ingredients on the back of a tricycle, modified to protect the ingredients from the elements. Bicycle repairmen arrange their tools in a tricycle chest. Light electronics, book and produce vendors hawk their goods from a wide wooden plank on the back of a tricycle. Nearly all goods delivery in urban areas is by bicycle or electric bicycle. Fuel, such as coal briquettes and natural gas tanks for households and restaurants, or filtered water jugs, are carted around on a variety of small bikes, trikes (sometimes with a motor) and electric bikes. 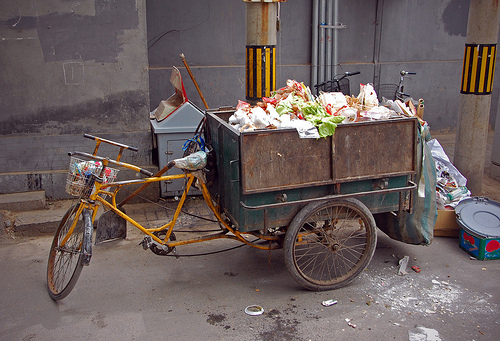 Garbage collecting by cargo cycle in China. Photo by Tim Quijano. These small-time entrepreneurs are, unfortunately, often the target of chengguan, or “city management” clean-up raids, in an attempt to make cities appear more developed and “civilized” in the eyes of political elites. 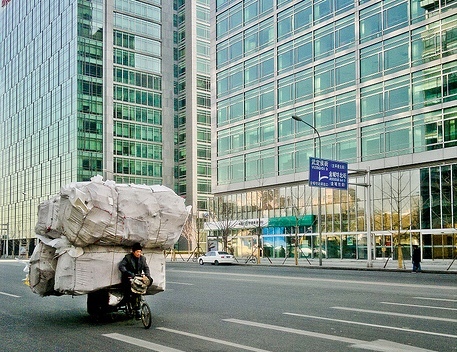 While the Chinese cargo bicycle system is far from perfect, the EU could learn from this system. Furthermore, carbon emissions prevented in China are as beneficial to averting climate change as they are in the EU. This capital-extensive cargo bicycle system, while encouraged by the EU, is being actively discouraged by China, a land mass and population of roughly equal size, and thus of equal importance with respect to international environmental politics. The CYCLE Logistics project could achieve its goals by supporting the development of non-EU partners. On the one hand, members of the EU could learn from China’s use of cargo cycles, and on the other hand, the Chinese could benefit from the EU’s promotion of expanded use of the cargo cycle in other continents, in effect, protecting the development of small-time businessmen.